This is another record that I have been after for quite some time. Though I wouldn't call it exceedingly rare, I have had a difficult time finding it at a decent price. Typically when these things end up on Discogs or eBay, people seem to think this is a $50 record. Then it tends to go unsold. Finally one of these popped up on Discogs for about $20, and that was my price point to add the vinyl version of this to the collection. 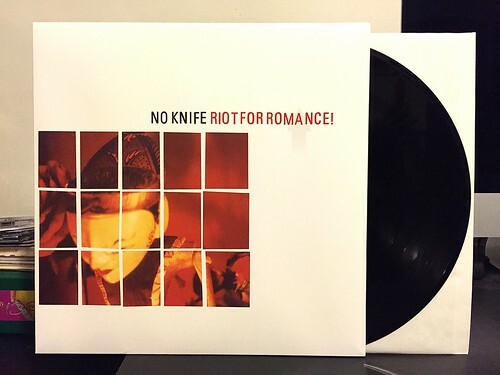 Riot For Romance was the last No Knife album and you could make the argument that it was the worst of the four. But using the word 'worst' is kind of silly as even though this album may not have been quite as perfect as some of the band's other records, it is still a pretty fantastic album. No Knife's entire discography is extremely strong and every album is borderline essential to have in your collection. The way the band is able to layer guitars and shift the dynamics of songs, even within the same song at times, has impressed me to no end. Few bands can go from a loud booming guitar part and so seamlessly segue into a quiet, bass driven mathy breakdown. To me the album is really held down by the standouts "Riot For Romance," "The Red Bedroom" and one of my all-time favorite No Knife songs "Permanent For Now." With a gun to my head, I probably say Fire In The City Of Automatons is my favorite No Knife record, but Riot For Romance is no slouch either. I'm thrilled to finally add it to the collection and I certainly wouldn't mind if the band decided to start putting out some new records. 2002 is way to long ago at this point.